dreams. 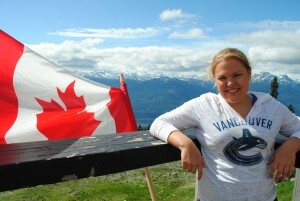 Anyone who knows me knows that I am a stereotypical Canadian. I spend most of my days watching hockey or curling, I say ‘eh’, and most of all I am so proud of my country. I know what a blessing it is to be Canadian, and that’s why it’s difficult to comprehend why my country would abandon me, and so many others, who have Lyme Disease. The CDC (Center for Disease Control) estimates that the number of Lyme Disease cases reported annually has increased nearly 25-fold since 1982. They also estimate, that every day, roughly 822 cases are reported. While many people are seeking treatment for Lyme disease already, there are thousands more who aren’t and who don’t know they have Lyme. These are the people that need our help! Lack of knowledge by doctors, along with an inaccurate blood test, causes Canadians suffering from Lyme to be misdiagnosed. They are also refused proper treatment and forced to leave the country, paying out of pocket to get medical help. This is truly unfair. My hope is that by sharing my story, I will contribute towards stopping this injustice from continuing, inspire you to donate to the ‘Ride for Lyme,’ and help raise awareness of Lyme Disease. 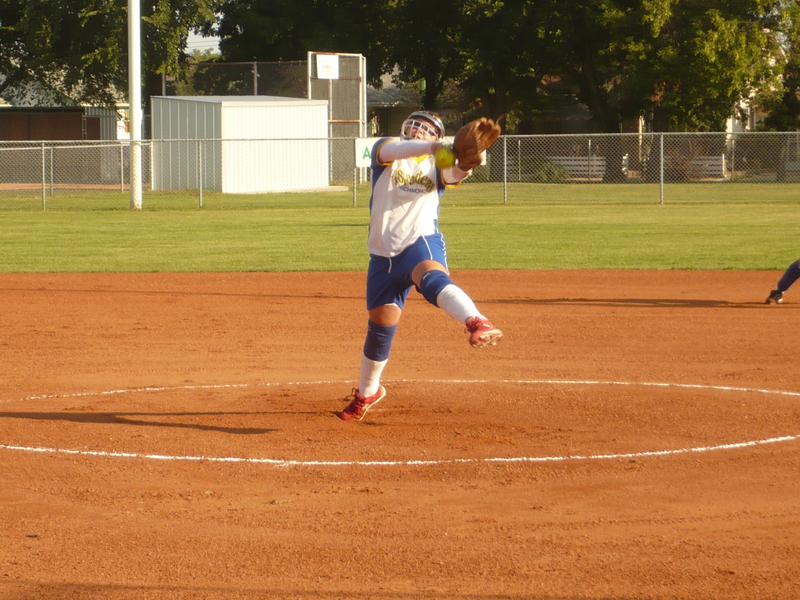 were filled with school, friends, sports and competitive softball. When I was 14 years old, I played in the Western Canadian Championship, where the team I was playing for won gold. After the tournament I was exhausted, experiencing extreme muscle and joint pain, and felt like I had the flu; I never bounced back. In the short span of 6 weeks, I went from being named the tournament MVP to being in a wheelchair. I was in constant, debilitating pain and gained 50 pounds. Something was definitely wrong! I spent the next year and a half with copious doctor/specialist appointments, countless medical and blood tests, emergency room visits, hospital stays and exploratory surgeries. I was bedridden with exhaustion, pain and weakness. I couldn’t process thoughts and words and I was unable to read or write. Strong pain medications got me through the day. As a result, I missed three years of high school, and could no longer play the sport I loved. I was totally dependent on my mom for everything. She was my advocate and fought hard to get the doctors to believe us that something was physically wrong with me. However, after months of testing and a long stay at Vancouver’s Children’s Hospital, medical professionals couldn’t find anything wrong with me, and concluded that it was all in my head. Since I never presented with a classic bulls-eye rash, and the standard Canadian Lyme blood test results were negative, they felt there was no reason to suspect Lyme. Desperate for medical help, my mother prayed and scoured the Internet for someone that would give us answers. In November 2010, after much research, we flew to California to see a doctor. In California, I found compassion, understanding, and a proper diagnosis of Lyme disease. It took over a year of bi-monthly trips to Los Angeles and a brand new Lyme culture blood test, before I was diagnosed with Lyme Disease in California. 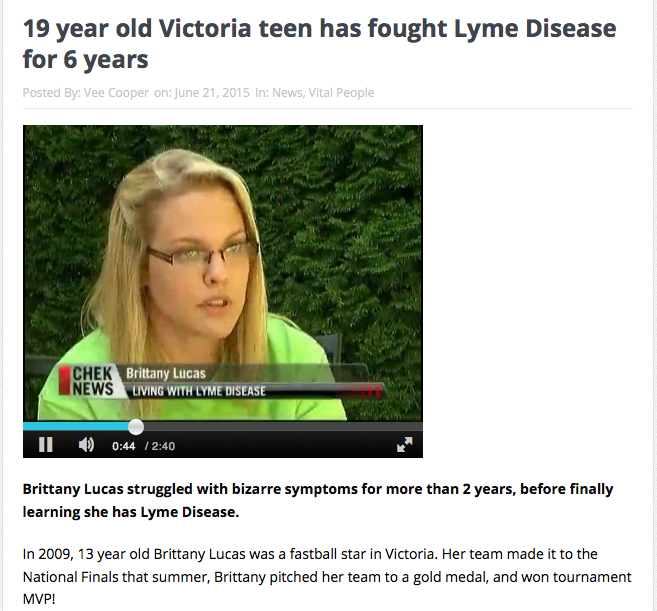 At that time, we knew nothing about Lyme, but we finally had a diagnosis. I knew all along, it wasn’t in my head, but it was such a relief to finally have an answer. The actual spirochetes, the bacteria that causes Lyme, are shaped like little drills; they replicate and burrow into every part of your body. The longer you go untreated, the more they spread. They are difficult to eradicate because they can disguise themselves within your body, can morph into other forms, and can protect themselves by cocooning in a biofilm. Getting a proper diagnosis has only been half my battle. When I returned home, the Canadian medical system turned their back on me. We asked to see an Infectious Disease Specialist; we were denied. When we showed my Canadian doctors my positive Lyme results they refused to acknowledge it. At one point, someone from the Canadian medical system called Child Protective Services, claiming that my mom was mistreating me by taking me to California for treatments they claimed were unnecessary. Due to these outrageous dismissals and accusations, we have been flying down to Los Angeles for appointments and treatments every 6-8 weeks for the past 5 years. My parents pay hundreds of thousands of dollars for my healthcare. In the time we’ve been going to California, my health has dramatically improved. Since I went undiagnosed for so long, the bacteria has spread throughout my body thus making it more difficult to eradicate. If the test in Canada was more accurate, and proper treatments available, thousands of people, like me, wouldn’t develop Chronic Lyme Disease. Once I was finally diagnosed with Lyme, we started treatments and I spent the better part of three years taking many different antibiotics that made me extremely nauseous and weak. However, we could see some improvement. The bad days were becoming fewer and my life was beginning to move towards that of a normal teenager. Then, about 2 years ago, things took a turn for the worse. Unfortunately, Lyme isn’t the only disease that ticks can transmit. A single tick can make a person sick with several diseases at the same time. I was diagnosed with Babesia, which is a co-infection of Lyme Disease. Currently, my days are filled with IV treatments and countless handfuls of pills. Again, some days, I can’t even get out of bed. Everyday I struggle with mental fatigue, brain fog, short-term memory loss and muscles that constantly quit on me. The most challenging symptom is the costochondritis. The cartilage connecting my ribs to my breastbone are infected and inflamed, so every time I breathe, it feels like I’m having a heart attack. I deal with the pain, but the hardest thing is not having the energy to do everything I want to do and live a life of a normal teenager. If I do too much, I spend a week in bed paying for it. I’ve always trusted that God has a plan for me and that this journey is happening for a reason. Over the years, I’ve struggled with depression and loneliness. My faith, friends, family and hockey have got me through my toughest days. 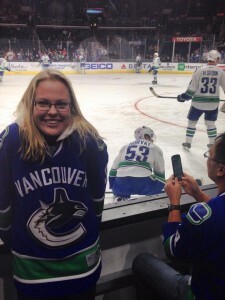 Meeting my favourite hockey players, and the friendships I’ve made, while in Los Angeles are my silver linings. I am grateful and feel blessed for the amazing people in my life. I wouldn’t be here without their support and love. Every day ‘Ride for Lyme’ dedicated a leg of their journey to someone in Canada battling Lyme Disease. Reading the stories of those across the country who are battling Lyme is devastating and makes me feel helpless. Everyone deserves a chance to follow their dreams and not have them destroyed by a tick the size of a poppy seed and out-of-date blood test. Athletes are losing their dreams, children are losing parents, families are falling apart, and children are being robbed of their childhoods. It’s time for change; people shouldn’t have to suffer this way. We have a constitutional right to healthcare in Canada and many are being denied. 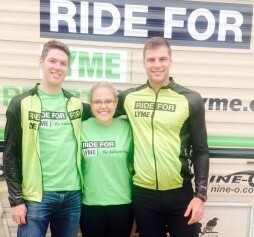 Please donate to the ‘Ride for Lyme – The Adelaine Project’. Every little bit helps those suffering. The money raised will go towards spreading awareness, promoting education, and researching ways to improve diagnosis and treatment of Lyme Disease in Canada. The sad thing is, if properly diagnosed, and treated with 4-6 weeks of antibiotics right after a bite, there is a greater chance of full recovery. However, far too many people aren’t that lucky. 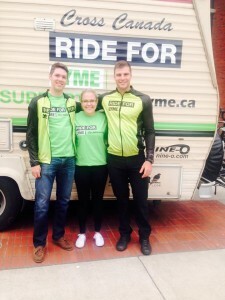 By donating to ‘Ride for Lyme,’ and in extension Can Lyme, you are helping change the way Lyme is diagnosed in Canada. Everyday someone is bitten by a tick, so please donate and let’s bite back. Someone close to you could be the next victim of Lyme Disease. You can decrease your risk of getting Lyme Disease by taking the right precautions and learning how to prevent Lyme Disease. Thank you for taking the time to read my story and share my story. By donating to ‘Ride for Lyme,’ you are changing lives and helping bring Lyme into the Lymelight! Philippians 4:13: I can do all things in Him who strengthens me.